I suppose this thriller is what we term “Scandi-Noir”, although you can imagine the events outlined happening in any location. It is claimed to be based on real events in the author's life. In which case I don't envy her. This engaging narrative is told in the first person by Sofia, an intelligent, well-educated twenty something who has heard about the interesting goings-on at a large estate on a small island off the coast of Sweden. She and her friend Wilma attend a lecture by Franz Oswald, the head of an organisation called ViaTerra, to all outward appearances advocating a thoroughly healthy lifestyle based on vegetarian and environmental policies. At the end of the lecture the two girls accept an invitation to attend a weekend course on the island, personally issued by Franz Oswald, who is tall, handsome and eminently desirable. 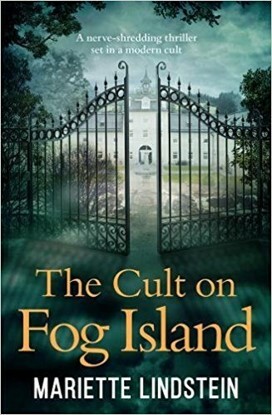 They catch the ferry to the island, which is indeed foggy, and chat to the elderly ferryman, Edwin Bjork, who explains that the people on the shore don't mix much with the people on the island. He also hints at tragic events in the lives of the aristocratic family who were the original owners. The last countess had thrown herself into the sea from the Devil's Rock, the highest point on the island, after her lover had drowned. Bjork claims that her ghost has been seen on the rock by a number of local people, clad in her black hooded cape. The two girls find this laughable and make their way to the manor house. The interior is modern, with exquisite interior design, and they are greeted warmly by Oswald, who has them shown to a luxurious bedroom. The weekend passes pleasantly enough, every comfort and beautifully prepared vegetarian food being provided. At the end of it Sofia is surprised to be offered the job of Librarian. The new, superbly equipped library will be all her own responsibility. She decides to accept the job, although Wilma has some misgivings. Alongside Sofia's story, there is a sub-plot in italics, featuring an unidentified man and woman. The man discovers a hidden cave on the island, and persuades the woman to join him in using it as a trysting place. I found this confusing at first, until the significance of their presence is revealed. Sofia's life at the island is enjoyable at first. The job of all the staff on the island is to service the rooms for the guests and maintain the house and gardens. They all seem happy enough with their lot. Sofia thinks Madeleine, Oswald's secretary, is jealous of the amount of attention he pays her. Gradually, though, Sofia comes to realise that Oswald is not the charming man he appears, but a power-mad fanatic who deals out horrendous punishment for breaches of discipline by any member of the staff, including having to jump from Devil's Rock into the freezing sea. They are all terrified of him. Sofia acquires a boyfriend named Benjamin, whose job is to buy stores for the manor, and who as a result of this is allowed to catch the ferry to the mainland fairly frequently. They move into a double room (this is allowed if it is a steady relationship), and Sofia is happy for a while, but this does not last as Oswald's behaviour becomes even more extreme. Sofia realises they are all prisoners on the island and no escape is possible. This novels is deeply involving though at times I felt the reader’s credibility tested but that being said, the denouement is really, really scary, the topping on a most intriguing novel.